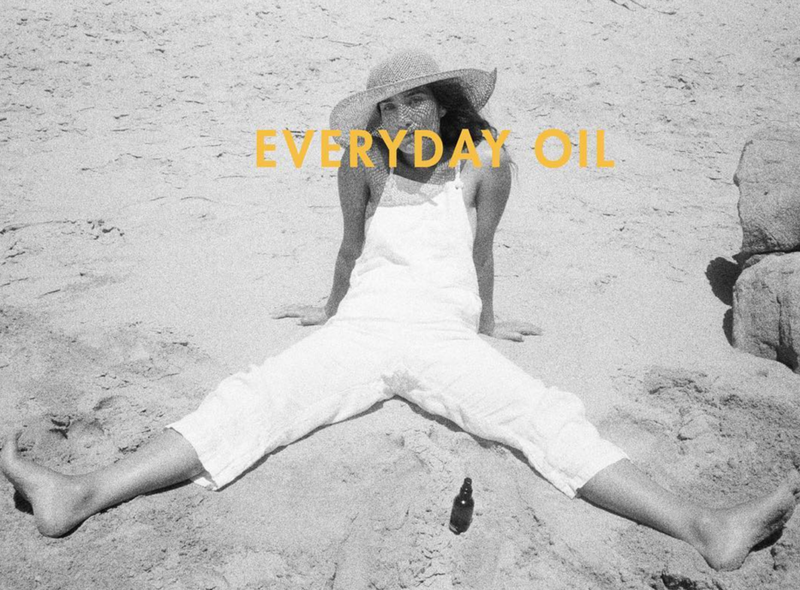 Everyday Oil • Emma Allen — To Be Magnetic™ | Manifest the life you deserve for less than a dollar a day. Last summer, I was perusing the shelves of Dimes Market in Chinatown, NYC with Ally Walsh when I stumbled upon a dark brown little bottle with the best retro packaging I had seen in a long time. Instantly drawn to Everyday Oil, I had to give it a try. It wasn't until I saw it over and over again that I finally reached out to founder Emma Allen. It's now become one of my favorite oils, that I mix daily with shea butter, and people always compliment my scent when I wear it. Today we meet the beauty behind it. Well, to be honest I never set out to be in the holistic beauty care world, but I wanted something that did not exist, and at some point. around 8 years ago I started trying to make the thing that I wanted … and eventually I did. I loved it so much that I wanted to share it - and that thing is Everyday Oil. Well, it started very simply with wanting to use oils on my skin, and being frustrated with what was available. I wanted a better blend of oils that covered more bases - better texture, better smell, better price and size – and It just seemed like there was a big hole in the market. When I read about oils, the science behind what they are capable of doing for our skin (and their history), it just seemed obvious that the skincare market was missing the boat. The world needed a big, beautiful bottle of amazing oil for skincare, and for everyone. In terms of things that inspire me, I would say I’m very moved by simplicity and minimalism, and I have always loved the idea of generics. I felt like when I was making Everyday Oil I was really creating a new product category - since there was nothing exactly like this on the market - so in the branding and packaging of Everyday Oil I loved the idea of making this new product category, and making the ultimate generic product for that category. If that makes sense? Like, making the most affordable, inclusive, versatile possible version of this product without sacrificing quality or beauty. Our mainstay has Palo Santo or “Holy Wood”, which is a really beautiful wood from South America, used by Shamans and healers there in ceremony as a spiritual healer and cleanser, clearing away bad energies and removing impurities. It’s use goes back to the Incas, and it is burned as a kind of sacred incense - cleaning the energy field of people or places. The essential oil, which is a super concentrated form of the oil from the wood, contains antioxidants and phytochemicals called Terpenes, including Limonene and A-Terpineol, which fight free radical damage and are anti-inflammatory for the skin. Palo Santo has an amazing presence, and you can tell it is very special when you experience it, either in the wood/incense or essential oil form. It is said to raise your energetic vibration, be grounding and bring good fortune. I love the combination of it being grounding and elevating at the same time, and this is something I was taught by a beautiful woman to ground myself. The meditation proceeds by picturing a deep connection of my body to the earth while also picturing a golden light beaming down from above and gently pulling me upwards as well. Palo Santo is a good partner for this process, and I recommend it. Castor Oil – In old novels grandmothers are always trying to get kids to take a daily spoonful of Castor Oil, and kids were always hating it, but medicinally and therapeutically it goes back to ancient times and has been traditionally used in India, China, Persia, Egypt, Africa, Greece, Rome and 17th century Europe (as well as the Americas). 4,000 year-old castor bean seeds have even been discovered in Egyptian tombs. It is incredibly, incredibly healing. It is super cleansing and purifying. It is very high in Ricinoleic acid, which inhibits the growth of many bacteria’s, viruses, molds and yeasts, which is one reason why castor oil has been known to work well on acne as well as other skin conditions like ringworm, scars, and fungal infections. Castor Oil also is very effective in encouraging hair to grow, so I recommend using it on your eyebrows and eyelashes at night for a little serum. Geranium – Wow, Geranium is just so beautiful as well. Geranium was used by the ancient Egyptians for radiant skin. It has astringent properties that tighten pores and has powerful cicatrisant (cell regeneration) properties, which increase blood flow just below the surface of the skin, illuminating a glow. It is exceptionally anti-inflammatory and is one of the best oils for diverse dermatological problems like congested skin, eczema and dermatitis. It was used traditionally to uplift mood, energize, and for emotional wellness. In aromatherapy it is used to treat acne, anxiety, depression and insomnia as well as to balance hormones and heal wounds, incisions and irritations to the skin. Composed primarily of fatty acids, geranium has been shown in studies to be anti-microbial, anti-fungal and is often used as an insect repellent. 1) Well, the first one is a bit obvious, but I’m constantly surprised by how many people who use Everyday Oil don’t realize that they can use it on their face and as a face wash. It is a one stop shop in terms of skin care, and the face is the best part. Stop using soap on your face!!! 3) I’m not going to say the third one, but use your imagination and maybe you will think of what it is. Hmmm … my entire career has basically felt like a wild manifestation… although, I didn’t have that word before. When I was young I didn’t really know what I wanted to do, but I was interested in design and so I was working at a restaurant and taking technical design classes at FIT, and feeling pretty un-tethered but hoping that I would feel my way through. I decided to take an International Trade Class there. In the class, we read a book called “The Travels of a T-shirt in the Global Economy” (great book), and in that book they talked about a textile recycling company that had a huge vintage archive of clothing and textiles where designers and vintage buyers sourced their stuff. Having grown up in a very small town in the deep south, vintage clothing and Goodwill were basically my only ways of expressing myself through clothing – so I had formed a deep attachment. I could not believe that there was this huge backdoor to the vintage clothing world! I called them and I went there, and I ended up managing that dept. for three years. I worked with vintage buyers and designers from all over the world. I think that was when I first started realizing that I could follow interests - follow a thread - and it would take me places. Rocks! I always have a few big, nice rocks in my bathroom and in my house. I love them. Sweating – I try to sweat every day and it makes me feel so much better. The ocean and bodies of water (rivers, streams) – feels like home to me. The sun – I try to go out in the middle of the day and put my face to the sun. Ok, I’m reading my list here and it’s absurd, so #5 is just going to have to be two – the actual ground, and Everyday Oil. Well, I am not sure where I live at the moment, but the place that still feels most like home to me is Springs – the bay side of East Hampton. You have to go to the walking dunes, it is like a mini Sahara by the bay and somehow no one knows about it. You have to go to Long House Reserve and walk the beautiful Japanese Gardens and see the giant Yoko Ono checkers board - made of all white marble to symbolize peace between opposing forces. And you have to go make a fire on the bay and cook some fish by the water with friends. How our FN team is moving through the Full Moon into autumn. Angela Shore, founder of Jiva Apoha, pairs the magical oils of the brand with The TOOLS to further support your unblocking process. Wait, can we coin the acronym WMR (Whoa Mercury Retrograde)? I know. That's why we've been trying to take little conscious breaks during the day. Hint, they are the same thing. Let's learn why. The grooviest art, self-care for the self aware, oxytocin, today I'm starting rolfing, the turmeric dyed crop I'm living in, and integrating your shadow. Foraging lilacs and crafting a beautiful spring oil. A VERY affordable 2-in-1 oil cleanser and moisturizer that's basically a mini facial. Angela Shore of Jive-Apoha shares some vibrational insight into her latest Native medicinal oil—Thunderbird. A force that takes today’s cosmic energy—Full Blood | Moon Eclipse—to the next level. Here is what you’ll find in my spring fever line-up! Your new favorite oil with 22 active skin-healing phyto-nutrients, collagen building phyto-ceremides, wrinkle-preventing anti-oxidants and nourishing vitamins and minerals.